Golf is a very popular game. Some people prefer to play golf to be closer to nature. Others forget about everything except the small ball when playing. For them, golf is a way to relax and relieve stress. Anyway, this kind of sport helps to feel forever young and lacks an age limit. Besides, golf is a good way to spend time with your family. And, of course, thousands of people who love golf and have been playing it for years become professional golfers. They all need the best golf bags. No matter whether you are a pro or an amateur you have probably already got a stylish cap, cool gloves, super golf shoes, you lucky golf club and favorite white ball. I daresay those valuables need to be stored somewhere. Online stores offer many golf bags of different types. Let’s find out what golf bags are worth your attention. Golf bags of this type are very lightweight. A pencil golf bag is very easy to carry. That’s good. However, such a bag could hardly keep your golf clubs safe from the drops of rain. And that’s bad. Also, you cannot put a dozen of clubs there. Though this type of golf bags is not designed to accommodate plenty of golf clubs, to begin with. Either way, enjoy carrying your golf equipment on a warm day! Stand golf bags are larger than pencil bags. They are rather capacious. You can accommodate not only your clubs, ball and gloves and other necessary things, but also some of your clothes. It is not too heavy and can be propped up with ease thanks to its two retractable sticks. They help to hold the bag on the ground while you enjoy your favorite game. Cart bags are bigger than carry golf bags. They are much heavier and could be transported on a handcart or power cart. A cart golf bag is not meant for carrying over the shoulder. For that, it’s better to use lighter golf bags of other types (see above). A cart golf bag is made of durable materials. 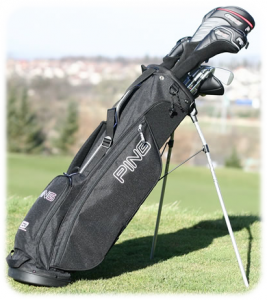 Cart bags are designed for optimal organization of your numerous golf equipment. You can get any of your clubs very quickly while the bag is standing on a cart or any other even surface. 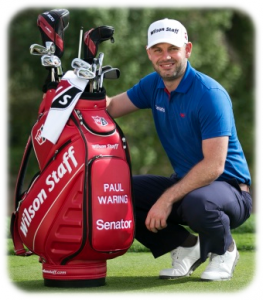 As a rule, staff gold bags are produced for professional golfers. Certainly, if you want people to think that you are a pro, you can choose one. These bags are cool, luxurious and stylish. Also, these bags are heavy, huge and comes at a very unreasonable price. If these things don’t stop you, a tour golf bag with a nice logo on the side is just what you need. The bag is made of high-quality materials. It has full-length dividers and many pockets for your golf gear and personal things. This bag is good looking. The construction is sturdy. You can choose any of the team logos; it is done very nicely. Probably, the bag is one of the best golf stand bags. It has fourteen-way full sleeve dividers, where you can put all your golf clubs. It doesn’t take a lot of time to find out whether you’ve left a club somewhere or everything is right there, where it should be. The bag comes with a top handle and a back handle. They are very durable. Five zipper pockets are at your disposal. In addition, there is a cooler pocket, which is meant for holding a water bottle or a can. There is a towel ring on one side of the golf stand bag. The bag also has an umbrella holder, where you can place your umbrella and be ready for a rainy day. One more advantage of this bag is that it comes with a removable rain hood. It will protect the clubs from rain drops. The fleece-lined case is meant for your valuables. 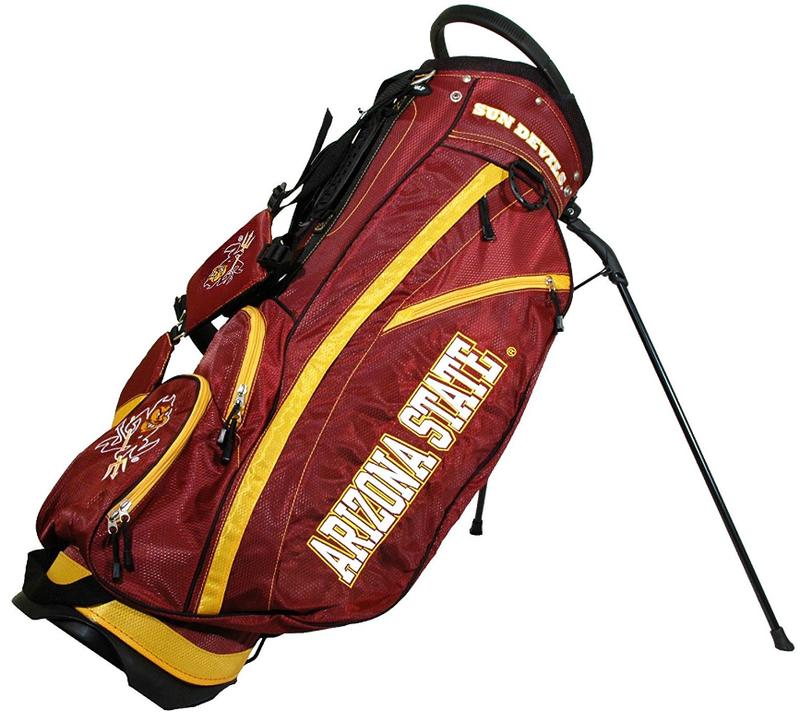 One of the most popular golf cart bags. Callaway specializes in golf bags and updates and makes them better every year. 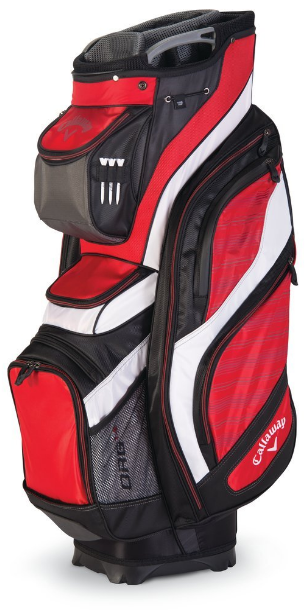 It will not be too presumptuous to say that Callaway 2016 Org 14 Golf Cart Bag is the best golf cart bag. Let’s have a closer look at this bag. This golf bag is made of high-quality materials. Its exterior is very attractive thanks to the bright colors. White-light blue-charcoal, white-black-orange, camo and other colors are available. Please note that bags of some colors could be more expensive, than others. Its main compartment for clubs is organized perfectly. Full-length dividers allow you store your clubs securely. Unlike 2015 Org 14 Cart Bag, it comes with a rain hood. The bag has a steady strap system. It can stand not just on a golf power cart, but on a pushcart, too. The handles at the top are durable. The roomy pockets are for your golf essentials, including a pocket for balls and one for a rangefinder. Also, there is a sleeve for an umbrella. The insulated pockets on front of the bag will keep your drinks and fruits cool. This lightweight carry bag is a perfect option for a beginner. Enough to call it the best carry golf bag. Also, it can be a good choice for those who don’t want to carry all their golf equipment with them. The bag is made of polyester. It is very light. If you golf gear consists of a couple of clubs, some small balls and other not very big and cumbersome things, this is a bag for you. It is easy to carry and to keep all your essentials secure. It must be the best lightweight golf bag. The bag is durable and can be used for years. The bag has some zipper pockets where you can accommodate tees, gloves or any other your essentials. Keys or a wallet can be placed there, too. The bag is not too bulky. It doesn’t occupy a lot of space so that you could put it in a trunk. It is comfortable to carry thanks to the padded shoulder strap. 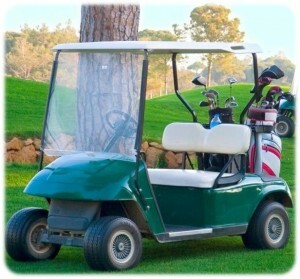 A perfect option for golfers who prefers going to the driving range and don’t like riding a power golf cart. This bag is made of fabric and nylon. It is not very heavy when empty. You don’t need to lug it thanks to its sturdy wheels. Besides, it also has a handle so that you could carry it. This travel bag is rather roomy. You can accommodate plenty of your golf essentials, such as clubs, tees, balls and other items. A golf bag can be inserted there easily. There is an adjustable strap inside the bag for fixing the golf bag. Moreover, if you’ve got a couple of pencil carry bags, they can be placed in this golf bag travel cover. The zippers slide very smoothly. 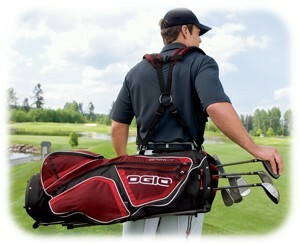 External straps help to store your golf equipment securely. There are two compartments on either side of the cover. They are meant for plenty of things, including golf shoes, not too long towel or some of your clothes. Enjoy traveling with this bag. It can be used as a carry-on while traveling by airplane. Please note that the lockable zippers are intended for storing your valuables safely. You can only purchase a luggage lock separately. Samsonite is an American manufacturer of luggage bags. They have been producing bags for more than a century. Samsonite’s bags are sturdy and light. All that you will ever need from a travel bag. The Golf Hard Sided Travel Cover Case is made of hard plastic. Its sturdy materials will protect all your golf equipment from damages while traveling. Its padded interior will protect the golf clubs. Moreover, the bag has a foam cushioning on the top so that you could keep your golf gear as secure as possible. You can wheel the bag behind you thanks to its four multi-directional wheels and two in-line wheels. They can swivel and maneuver. The travel cover case is ergonomically designed for your comfort. This bag should not be able to hurt your back. The handles are attached to the top and side firmly. They allow loading the case into a truck. There are two straps inside the bag. They fix your golf bag inside the case. This travel cover case is rather light and sturdy. It is a perfect option for traveling by plane, for example. SKB Corporation has been manufacturing guitar cases since 1977. Today, it designs molded polymer transport cases to protect all kinds of equipment, including music, sport, industrial and even military. This is the one of the best golf travel bags 2017. However, it is a high-value item. That is why the SKB 2SKB-4814W Deluxe ATA Golf Travel Case takes the third place of the top. This travel case is well designed and can store your golf clubs and other essentials securely. It is rather large and can fit your stand golf bag with ease. All of your clubs, balls, towels, shirts and shoes can be placed there. With all these things, there remains plenty of place for anything else. The surface of the case is not only water-resistant but dust-resistant, too. It is a perfect option for those who travel a lot with expensive golf equipment. There is no more need to worry about your gear while flying. It may seem too bulky, but that is because of its ultra-high molecular weight polyethylene. This material is used by the US military. Hopefully, that explains its solidity.